Firefighters battled for five hours as a blaze destroyed a van and damaged part of a home in Littlehampton. The property, in Genoa Close, was evacuated just after 1.30am this morning (April 12) as the fire ripped through a van, setting alight to the building and a second car in the driveway. A vehicle was severely damaged by the flames. 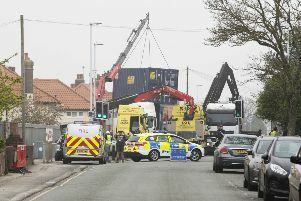 Six fire engines were called along with specialist units, paramedics and the police. A spokesman for the fire service said the blaze started in the van before spreading to the cavity wall of the home and a second vehicle. Photos taken at the scene show the burnt out shell of the van and flames coming from the ground floor of the house. Crews used 16 breathing apparatus, two hose reels, two water jets and a compressed air foam system to extinguish the flames. Firefighters at the scene of the blaze in Genoa Close. The fire service said no-one was injured and the occupants were out of the home before crews arrived. The flames were out by 6.15am but firefighters remained on the scene for a further hour-and-a-half dampening down and monitoring the home. The cause of the fire is being treated as an accident, the fire service added. Firefighters battled the flames in the earlier hours of this morning. Fire in Genoa Close Littlehampton.